Teddy Kremer's story is an inspirational one. Born with Down syndrome, to say he's a big Cincinnati Reds fan would be an understatement. He got a chance to get close to the team when his parents won a charity auction for a chance to be bat boy. Teddy's enthusiasm lifted the team's spirits so much, he was asked to come back and was even given a job with the team. Now he's been honored with a baseball card in 2013 Topps Update Series. The 2013 Topps Update Teddy Kremer baseball card is extremely tough to pull. It's a rare variation short print, taking up the same number as Reds superstar Joey Votto. While many other variations have had many copies show up on eBay, just a couple of the Kremer cards have surfaced. 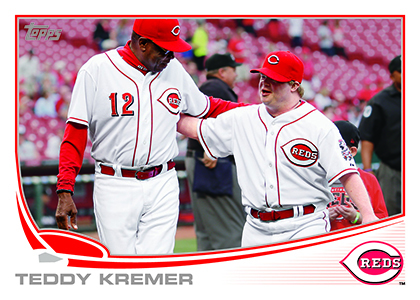 This is the latest in a series of feel-good stories to make their way to sports cards. Earlier in the year, Upper Deck worked with Jack Hoffman to create a special card to raise funds for pediatric brain cancer research. Upper Deck also included Purple Heart recipient, Doc Jacobs in 2013 Upper Deck Goodwin Champions. 2013 Topps Update Hobby Box Gerrit Cole RC Sapphire? Pink? Black? Camo Gold? 2013 Topps Update Hobby Box Arenado Yelich RC Sapphire? Pink? Black? Camo Gold? 2013 Topps Update Hobby Box Kluber Yelich RC Sapphire? Pink? Black? Camo Gold?